Last year, more than 13 million Americans hit crystal blue coastal water for an epic day chasing the world’s most coveted gamefish. Approximately 800,000 anglers enjoyed the thrill of saltwater fishing for the very first time. Whether they’re an experienced angler or just diving in to the sport, odds are if you live near the coast, one of those outdoors enthusiasts will land on your holiday shopping list this winter. Luckily, there’s no need to stress. Make your holiday shopping quick and easy with sure-fire gifts from Rapala® & Respected Rapala Brands meticulously designed to stand up to the demands of saltwater fishing. 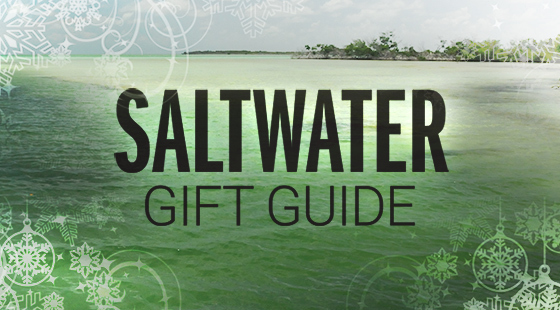 From the world’s favorite lures to accessories and quality apparel, check out the latest and greatest from the most trusted name in fishing for your gift-giving inspiration this year. Since its introduction, the Rapala® X-Rap Twitchin’ Mullet has quickly become a favorite among coastal anglers. Now, just in time for the holidays, the brand has introduced a new smaller-sized 06 model, filling a major void in coastal anglers’ tackleboxes. The new size 06 Twitchin’ Mullet features all the design elements that made the original an instant classic, but its smaller size allows anglers to fish the lure with more finesse, upping theirs odds of triggering more frequent bites. Featuring an aggressive side-to-side, walk-the-dog action just below the water’s surface, the Twitchin’ Mullet is a great go-to bait when inshore fish show their fins in the shallows. The lure’s slow-sinking action works especially well in a foot-and-a-half of water or less. A glide-and-drop technique allows anglers to place the Twitchin’ Mullet into pockets where big fish lie in wait to ambush prey. Realistic baitfish profiles and patterns help trigger bites too. Sure to be a hit this holiday season, the lure boasts a translucent body and 3D holographic eyes. The size 06 Twitchin’ Mullet is available in 12 color patterns. It measures 2-1/2 inches, weighs 5/16 of an ounce and is armed with two No. 1 VMC® Coastal Black™ 1X Inline Single Hooks. 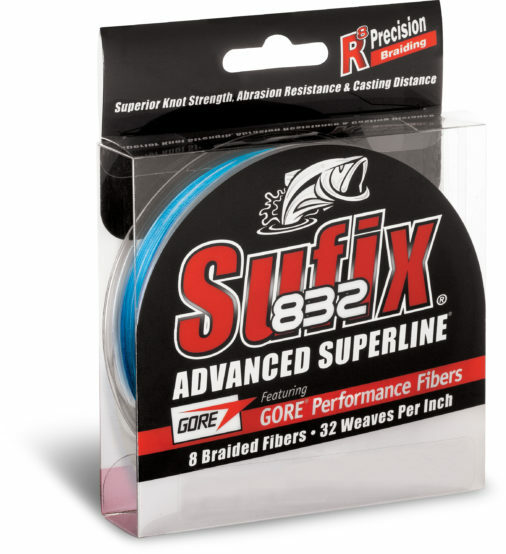 This winter, delight the anglers in your life with a gift that will virtually eliminate frustrating line breaks: Sufix® 832 Advanced Superline® .The line of choice for boating saltwater fish of all species and sizes in nearly any scenario, Sufix 832 is now available in Coastal Camo, an ocean-blue option perfect for fishing ocean-blue waters. Sufix 832 Coastal Camo not only offers an ideal presentation that blends in the waters where the world’s most coveted game species lurk, but it is also incredibly strong, sensitive and abrasion-resistant thanks to advanced braiding and fiber technology. Its proprietary braid of seven HMPE and one GORE® fibers woven 32 times per inch creates a nearly unbreakable superline that sets the market standard. Available in strengths up to 80-pound test, Sufix 832’s increased sensitivity makes it easier to detect subtle bites, a quality any angler who has set the hook too late will appreciate. The line also offers the ability to make extra-long casts and does not stretch, so when the lucky recipient of this gift feels a strike, their target fish will be pegged almost immediately. Find Sufix 832 Advanced Superline in new Coastal Camo at your favorite sporting goods retailer this holiday season in spools ranging from 150 yards to 3,500 yards. Just in time for your holiday shopping spree, Rapala®, the most trusted name in fishing since 1936, has introduced a new collection of long-sleeve performance t-shirts inspired by the elements earth, water and wind. Featuring the same patterns worn by bass legends like Ott Defoe and Brandon Palaniuk, Rapala’s new Mossy Oak® Elements Hooded Long Sleeve Performance T-Shirts boast a family of designs utilizing the core elements of nature. Coastal anglers will love the options of Sea Water, ocean blue camouflage and Bonefish, which is a great option for blending in when fishing beneath cloudy skies. 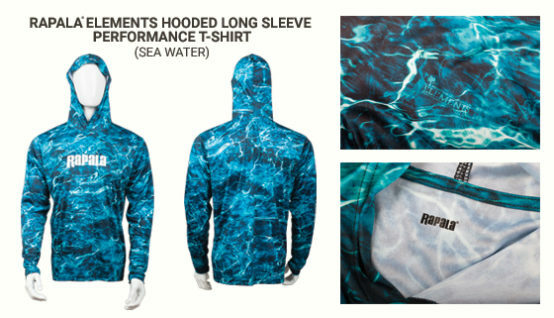 Each pattern featured on the new Elements Long Sleeve Performance T-Shirts is designed with multidirectional, photo-realistic images that disrupt the human outline, adding a new level of functionality to a sleek camo look. Each shirt is made with moisture-wicking material that will help your favorite angler feel dry and comfortable during long days on the water. 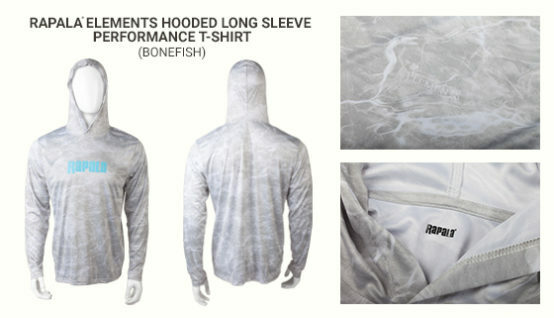 These innovative items also provide UV protection with an attached hood that shields the wearer from the sun. The best detail yet? They’re emblazoned with the iconic Rapala logo. While these dynamic new long sleeve tees are the perfect accessory to round out any anglers’ wardrobe, it doesn’t stop there. Visit Rapala.com to browse a wide range of premium apparel, including caps, short-sleeve t-shirts, hoodies and more. Wrap up a set of premium fillet knives and tools from the Rapala® Salt Angler’s collection for a gift that will wow your friends and family for years to come. Expertly crafted to withstand corrosive saltwater conditions, each item from the Salt Angler’s collection is designed with durable stainless or carbon steel and features ergonomic, co-molded handles for added comfort when tackling extensive filleting chores. Setting the high-water mark for saltwater fillet knives, the Rapala Salt Angler’s fillet knives are produced by the legendary Finnish blade manufacturer Marttiini, makers of Rapala’s best-in-class fillet knives for more than 50 years, to ensure uncompromising quality. The Salt Angler’s fillet knives are available in slim, straight and curved models with blade lengths between 6-1/2 to 12-inch, options that are perfect for steaking big game fish or finesse cuts in tight spaces. Each Rapala Salt Angler’s Fillet Knife delivers a razor-sharp edge that will make quick work of demanding filleting chores. Williamson lure kits deliver anglers a variety of their favorite baits in one shot, adding versatility and ease to every outing. Pick up one or all three kits to help them target their go-to species and make the holidays a hit. The Big Game Catcher kit is a heavy-duty 8-inch, four-piece trolling kit featuring concave pusher head faces that create an erratic action to entice savage strikes. Whether rigged with a Ballyhoo, strip bait or “naked,” this kit is a killer for billfish and large gamefish species worldwide. 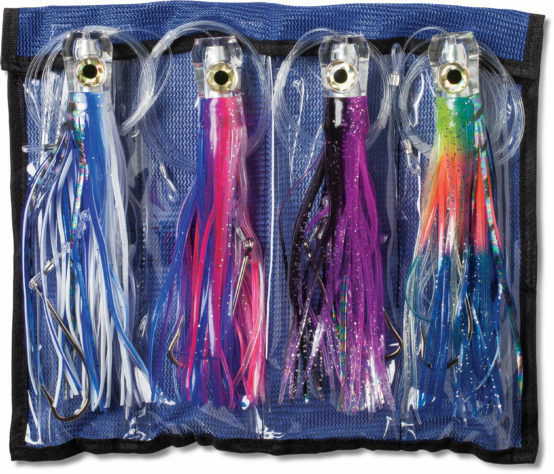 Each lure head features holographic 3D eyes with embedded holographic foil, trailed by a durable holographic foil skirt. Baits are pre-rigged with a 5-foot premium Sufix leader in 175-pound test and VMC® 9/0 hook. The new Flash Feather Kit also consists of four lures, each with a design that attracts Bonito, Spanish Mackerel, Bluefish, Dorado and Tuna. The kit consists of two 4-inch lures pre-rigged with 4 feet of 80-pound test premium Sufix® leader and a tough-as-nails size 3/0 VMC Hook and two 5-inch lures pre-rigged with 4 feet of 100lb. test premium Sufix leader and a size 5/0 VMC Hook. Last but not least, the Sailfish Catcher Kit is perfect for targeting its namesake species. With its rear Ballyhoo rigging spring cavity, the kit’s concave pusher design makes each bait ideal for use in conjunction with a strip bait or Ballyhoo. The kit includes six lures, including three 4-inch baits pre-rigged with 5 feet of 60-pound test premium Sufix leader and a 4/0 VMC hook and three 5-inch lures pre-rigged with 5 feet of 130-pound premium Sufix leader and an 8/0 VMC Hook. All baits in the new Williamson Lure Kits can be trolled at speeds up to 7 knots. 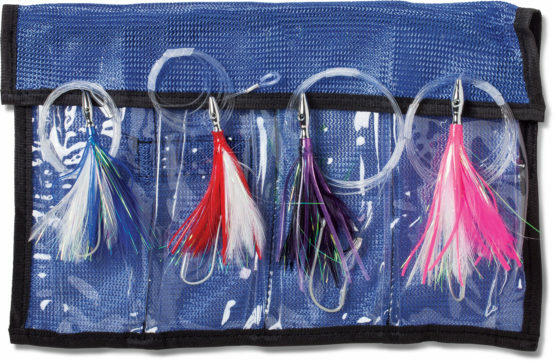 Each kit also comes with a complementary roll-up lure bag for easy storage.